Tonight’s shenanigans began as Santa Ana police officers conducted a traffic stop near West First and North Fairview Streets, at 7:58 p.m. 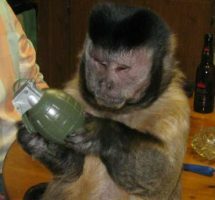 When the officers asked one driver if he had anything illegal in his car he casually told them that he had a hand grenade in his car. The bomb squad was called in after detectives found what looked like a hand grenade in the vehicle’s front passenger seat, according to the SAPD. The SAPD closed nearby streets and set up a perimeter. The driver was detained while the police investigated the matter. The bomb squad was still assessing the situation at 10:00 p.m. The grenade was finally rendered safe at about 10:10 p.m. The police still are not sure why the driver had a live grenade in his car. Where the heck would someone even buy a hand grenade?